"Queen of Resort Hotels," featuring the World-Famous Whirlpool Thermal Baths, with guests going direct from rooms to Bathhouse in robe and slippers ... 400 air-conditioned rooms, including kitchenette, new Lanai Tower, and poolside Lanai Suites connecting with Hotel. 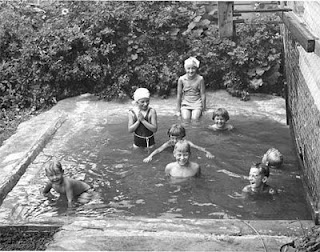 Year 'round temperature-controlled pool, with separate pool for the kiddies. European Plan, Dining Room, Luncheonette, Dutch Treat Grill, etc. "PRICES TO FIT EVERY POCKETBOOK"
There is a wealth of information online about the storied Majestic Hotel, which was in operation from 1882 through 2006. According to The Encyclopedia of Arkansas History & Culture, "for more than a century, the five-acre complex anchored the intersection of the main thoroughfares, Park and Central avenues, at the north end of Bathhouse Row in historic downtown Hot Springs." The hotel was a prime destination, hosting actors, sports stars and mobsters. The Pittsburgh Pirates and Boston Red Sox went there for spring training. 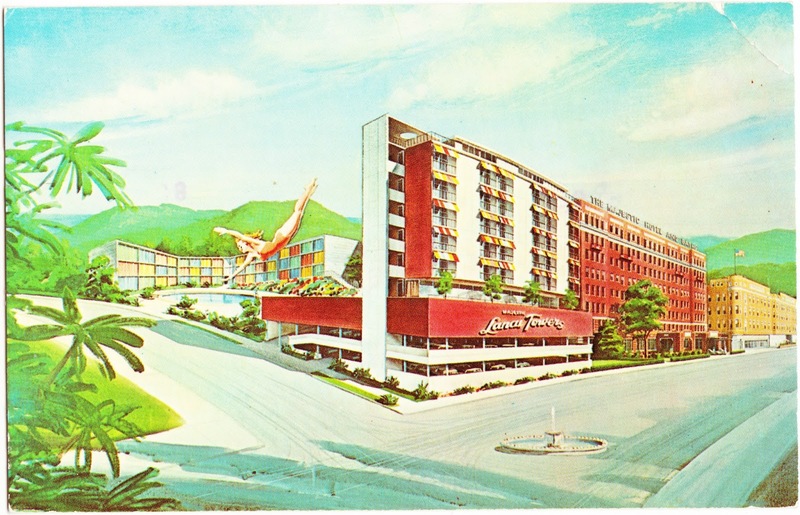 It saw numerous renovations and additions over the decades, including the Lanai Tower spotlighted on this postcard. In February 2014, the abandoned hotel was gutted by a fire. Then, just last month, the Hot Springs Board of Directors voted to purchase the hotel complex from Park Residences Development LLC for $680,000, according to ArkansasOnline. The finalization of the sale, however, remains in limbo. What's with the diving lady's leap of death to nowhere?